I’ve been a little sad that our schedules have been both too busy and unpredictable to get a Christmas tree this year. It’s been three years since the last. What I miss most is my ornaments. And the white lights. Sometimes we put up garlands in lieu of the tree. We did that last year. Then I can hang a few select ornaments (like Helen’s pickle). We are off to Portland later this week, so I have given up hope for this year. 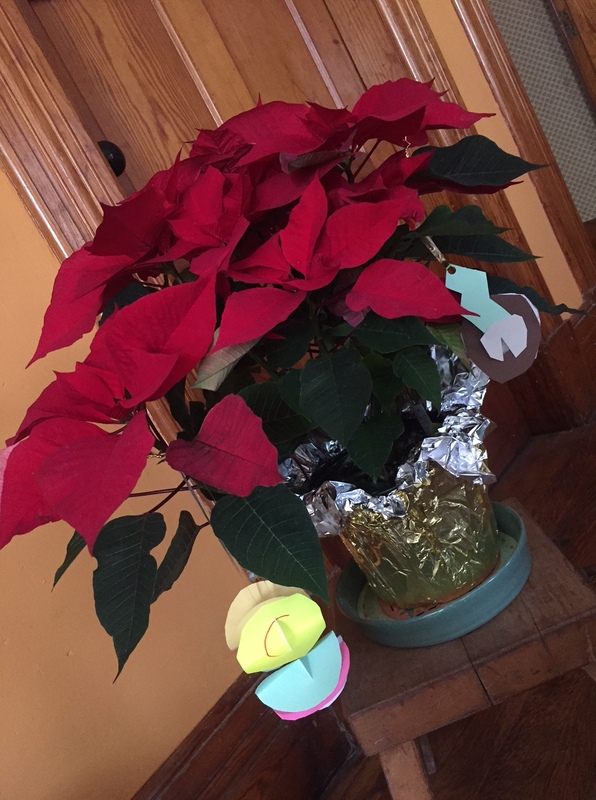 Last week Tim brought a poinsettia back from a music gig. Then last night two neighbor gals, Edith (8) and Evelyn (5), brought Tim homemade birthday cards and homemade ornaments. I promptly hung the ornaments on the poinsettia insteadoftree. Aren’t they fabulous? Lovely! I decorated my own (fake – 28 years old and counting) tree last week, and proudly put Helen’s pickle in it too. Linked across the world by a pickle. Thank you, Helen.